This post represents another installment in the series detailing the first of our three cross country National Parks camping trips with travel trailer in tow. Yellowstone, with its geothermal features, rivers, lakes, mountains and prairies provided us with a unique and incredible experience. Although our family spent four full days exploring this Park – our country’s first official National Park – we could easily go back and spend another week there. Each day in Yellowstone had its own special highlights, and one of our most memorable was the opportunity to watch the elusive wolf pack in the Lamar Valley. The wolves were distant, but easily visible with binoculars, and this marked the first and only time we have ever seen wolves in the wild. As much as we would have loved to spend even more time exploring Yellowstone, it was time to head south to Grand Teton National Park. It was a short but picturesque drive from Yellowstone to the Colter Bay Village RV Park. Although the village wasn’t large, services were completely adequate and this private RV Park made a good base camp for us. Due to the stunning views of the craggy mountains against that big blue sky, Grand Teton is one of my husband Alan’s favorite National Parks, and it wasn’t long before we began exploring. Looks like a number of people like to explore by horseback! I don’t consider myself a “photographer,” although I have been known to take several thousand photos on an extended vacation like this one. But, actually, I think of myself more as a “documentation specialist” – sounds fancy, doesn’t it? Don’t get me wrong – I do adore landscape photography and I try my best to compose and frame shots to the best of my current ability. But the photos that stand out in my mind (and tug the hardest at my heartstrings) are the ones that document a moment in time during one of our family adventures. One of our photos from Yellowstone is just such a picture. My husband and daughter (a very tiny age 5 at the time) were walking the boardwalk amid some of the Park’s thermal features and I snapped a pic from behind. They are holding hands; he is looking down at her and she is looking up at him – just so precious. Another photo I treasure is of our son when he was 17, taken on our first visit to Acadia National Park. We were down at the docks in Bar Harbor and he was casually leaning on the railing with a ball cap and sunglasses shading his eyes. When he turned my way, it struck me that he was no longer a little boy, but a young man on the brink of adulthood. It’s still one of my all-time favorite photos. But, I digress. I don’t know how you managed to get me off track. Back to the Grand Tetons . . . This National Park, like so many others, is a photographer’s paradise. With the Tetons as a backdrop, the Snake River meanders through the Park, creating many wonderful photo opportunities even for those of us who are amateurs. Why can I not stop taking photos?! 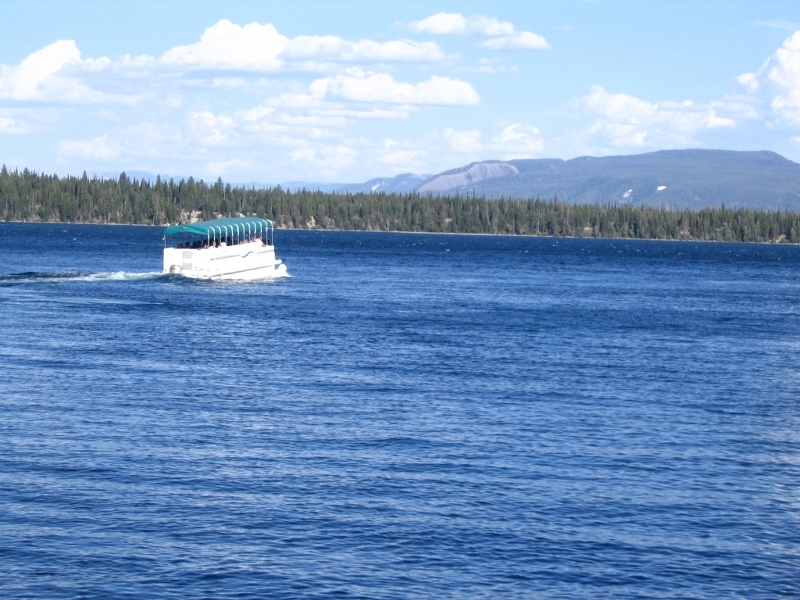 Although Jackson Lake is by far the largest, there are a number of other lovely lakes in this Park. We headed out to Jenny Lake knowing that the trail to Hidden Falls began at the far side of it. Despite our daughter’s innate athletic ability, we were concerned that her tiny legs would tire long before we hiked around Jenny Lake and connected to the trail to Hidden Falls. So, it was an easy decision to pick up the shuttle boat that ran from the dock near the Jenny Lake Visitor Center to the Hidden Falls trailhead. It worked out perfectly for us with both kids enjoying the hike and no one becoming trail weary. But, if we were to hike to Hidden Falls again, I’d think I’d forego the shuttle and just take our time making our way around Jenny Lake. The shuttle ride itself was an excellent experience but, because it disgorged a whole boatload of passengers at once, the trail to Hidden Falls was crowded and the peaceful and pristine area on the back side of Jenny Lake lacked the solitude that I would have preferred for a hike in the woods. That being said, however, we had the most delightful wildlife experience while on the trail to the falls. A Mama Mule Deer crossed the trail from east to west, directly in front of Alan. We were all stunned considering the number of people that were on the trail. Adding to our amazement (and amusement), a Baby Mule Deer appeared immediately after and quickly darted across the trail to catch up with Mama. (I trust that Baby eventually grew into his/her enormous ears!) By a sheer stroke of luck, I was able to get our wildlife encounter on video and, no matter how many times I watch it, my enjoyment never wanes and I still can’t believe how fortunate we were. Back on shore near the Visitor Center, after completing the hike, we continued south through the park and visited the Menor’s Ferry Historic District which includes Bill Menor’s cabin and general store, the ferry, and the Chapel of the Transfiguration. Please watch for a future post with details about the Chapel; for now, I’d like to tell you more about the ferry. Bill Menor was a pioneer who settled in this area known as Jackson Hole in 1894. He built an intricate ferry system to allow other homesteaders to cross the Snake River which divided the valley. When the conditions were dry, it was possible to cross the Snake in several places but, when the river was running high, even those few spots were impassable. Although it looks quite calm in the photo below, the appearance of the water is deceiving and it was anything but tranquil at Menor's Ferry that day. The Snake was actually running hard and fast, and the speed with which a number of rafters were passing by was astounding - and a testament to the need for a way to cross the river in relative safety. We love sharing hands-on educational experiences like this with our kids! The ferry that is currently in place is a replica of the original, and my understanding is that it is still in operation so that modern day explorers may experience a river crossing on Menor’s Ferry. Interpretive Park Rangers will safely shuttle you across the Snake River and answer your questions about the ferry and the historic district. The original ferry was sold in 1918 and operated until 1927 when a bridge was built just south of it, making the ferry obsolete. Our exploration of the Menor’s Ferry Historic District was fascinating and the time we spent in the Park was memorable for all the right reasons. But Colorado was calling, and it was time to move on to Rocky Mountain National Park, the last Park on our itinerary for this cross country trip. Please do come back to visit and travel with us as we continue this epic journey! Grand Teton National Park offers a tremendous number of opportunities to enjoy the great outdoors in one of the most beautiful locations imaginable. For information about the Park in general, as well as specific activities (scenic drives, camping – including backcountry camping, wildlife viewing, hiking, biking, fishing, boating & floating, bird watching, horseback riding and climbing & mountaineering), be sure to visit the National Park Service web site (link HERE).